A six pack is one of the most in demand features for those striving for physical perfection. And it’s no wonder when there are images plastered everywhere of models, athletes and celebrities with flat stomachs and rippling muscles beneath a taut layer of skin. We are led to believe that these sort of results are realistic and easily obtainable. And while they certainly are achievable, getting a strong, lean abdomen takes discipline and perseverance. There is no magic trick or quick fix on how to get abs. Just doing one of these will not suffice. It requires hard work, dedication and maintaining an overall healthy lifestyle. For some people getting abs seems so easy. For others, including myself, it seems as if there is some hidden mystery to it or that it must be connected to the type of genes you inherit. However, what I have found is that doing ab workouts, even the best ab workouts will not get you any gains if you don’t know how to hold your core. Poor form in any ab workout will kill any gains. Diet is important too if you want to see those abs. I think you already know this. But I feel that building a strong core first is much more important than your abs simply being visible for others to see. The right diet will make the abs that you’ve built up ‘pop’ through, but having a strong core and abs will provide many more benefits whether they are seen or not. This guide is designed to help motivate and educate you on how to strenghten the core and how to get abs at the same time. If you’ve tried many times to get abs (through numerous ab workouts) and have seen no progress, it’s likely that there is a problem with your form or a misundersanding of how to embrace the core during your workouts. If this is you, then you’ll find this post of great help. In this post I’ll attempt to cover all the things I feel is necesary to help you build a strong core. This includes understanding simple muscle anatomy and how to embrace your core during workouts. In addition, I’ll add in some extra workout videos for you to try. The Myth: Why the Long Post? Can’t I just do Loads of Crunches Everyday? One of the most important messages you can take from this article is that you cannot spot train abs. There is a big misconception that doing 1,000 crunches is going to help you get abs. To get abs you need to work the whole core, which includes all the abdominal muscles that wrap around your waist. There is also another key to the formula: You must drop overall fat. Everyone has abs, it’s just hidden under a layer of fat. It’s this layer that you need to break down. This will come down to your everyday diet, which we will look at briefly later on. It’s important to understand the primary function of the abdominals, and it’s not all about a toned appearance. Your abs main purpose is to protect the spine and support the back. Having a strong core will also have a positive effect on your posture, which will also improve as you strengthen your abs. You may be surprised to learn that having a strong core helps will many different movements and activities you perform during a normal day. Strengthening your abs will reduce or prevent back pain caused by everyday acts such as sitting, standing, bending, twisting and lifting, in addition to improving your balance and stability. You’ll also decrease your chances of developing core related posture dysfunctions such as the now common anterior pelvic tilt. Thos are the extra perks of your hard work! Personally I feel these benefits are much more profound than being able to show off a six pack! To get the results you’re after, you first need to know the muscle group you’re targeting. Your abdomen is comprised of four different muscles and it’s important to understand what each muscles does and how concentrating on each area will yield individual results. Rectus Abdominus – the most important muscle to focus on if your end goal is a six pack. This is the muscle that lies closest to the surface of your skin, on top of all the other abdominal muscles. It runs vertically up and down the body and its’ main function is flexing and bending the spine in order to move the body forward. Enhancing this muscle can result in the desired six pack, but only if you burn belly fat simultaneously. Targeting this muscle can actually make you look bigger if you don’t melt the fat as well. Internal Obliques – lay on either side of body next to the Rectus Abdominus and stretch from the front of the stomach to the back of the torso. These muscles bend and twist the torso and rotate the spine. Strengthening these muscles will help to whittle your waist, improve your posture and promote back health. External Obliques – lay on top of the internal obliques and run diagonally down from your ribs toward the pelvis. These muscles allow you to rotate and bend sideways. Like the Rectus Abdominus, these muscle sit close to the surface of your skin, so honing in on them will create results you can see from the outside. Most ab workouts you’ll find will focus on the rectus abdominus. A good ab workout or exercise will include all core muscles. For most of my life I didn’t have a clue that this muscle existed. I knew of the general ab muscles (Rectus Abdominus), however I did not know that these muscles lay underneath. If you’ve been working on your abs for a while and haven’t seen results, or you have a weak core, this is the muscle that now needs to become your friend. I know that once I learnt to activate the Transverse Abdominus, everything changed from that point on and my core started to become stronger and my overall posture inproved. The video above explains why the Transverse Adominals are essential to strengthening to core and outlines how you can begin to activate those muscles. I highly recommend watching this video before proceeding on with your reading. Once you know how to activate these muscles groups, you can begin embracing the core properly and go into all your workouts with the transverse adominals tensed up. Learning to work your abs properly is crucial. You could spend a longtime working on your abs plan but see little to no results because you aren’t doing something correctly. One personal experience is not being able to a plank properly. Be sure to check out the following tips. This may sound like a simple thing, but breathing properly is one of the most important elements in correctly performing an ab exercise. Exhale as you move into the “crunch” pose of the exercise while pulling your belly button to your spine. It is very important to pull the belly and abdominals in. If you push them out during the exhale, you could very well end up with the opposite of the flat stomach you’re pursuing. Focus on quality over quantity. Busting out 100 mediocre reps is a wasted effort. Stop straining, huffing and puffing and make every movement count. Perform each rep slowly and meaningfully, feeling each muscle in your core contract, and holding at the peak of exertion for a few extra seconds. Switch up your moves. Don’t do the same moves the same way every time. Pick three moves to focus on for each workout. Pick a different three the next time you work out. And once you’ve mastered a move, don’t get lazy; challenge yourself with a more difficult version of the move. This prevents your body from getting stuck in a rut. Having muscle means nothing when you have a layer of insulation covering it. So, in addition to building muscle, you must also burn the fat. Cardio is KEY. The most effective way to burn fat is with High Intensity Interval Training (HIIT). This type of workout burns the most calories in the shortest amount of time due to the variety and intensity of the exercises. To get your abs we highly recommend incorporating these into your workout plans. For some excellent videos on intense cardio, check out personal trainer Dana Grokker’s 20 minute cardio session. Personal trainer Sara Kusch’s 25 minute Cardio Core workout is also one to look out for. For both workouts no gym or equipment needed! If you’re pressed for time these 7-minute HIIT workouts from Runtastic Fitness and Grokker. Try this 18 minute HIIT workout from GymRa. Or if you’re new to working out, check out this 17 minute HIIT workout with beginner modifications. Diet is absolutely imperative. Watch the video below to see how important diet is to getting abs. He may talk in a rough tone, but it’s an important message and he certainly gets the message across! Your body needs the right fuel to rebuild those muscle fibers after a workout. That means no crash diets, no starving yourself, and no eating whatever you want just because you broke a sweat. But it also means not punishing yourself if you stray from your diet once in a while. It’s okay to indulge once in a while. Schedule yourself a “cheat day”– eat whatever food you’ve been craving one day a week to prevent a breakdown in your overall diet, which can lead to a junk food binge-fest down the road. Steer clear of processed or packaged foods. Clueless on where to start? 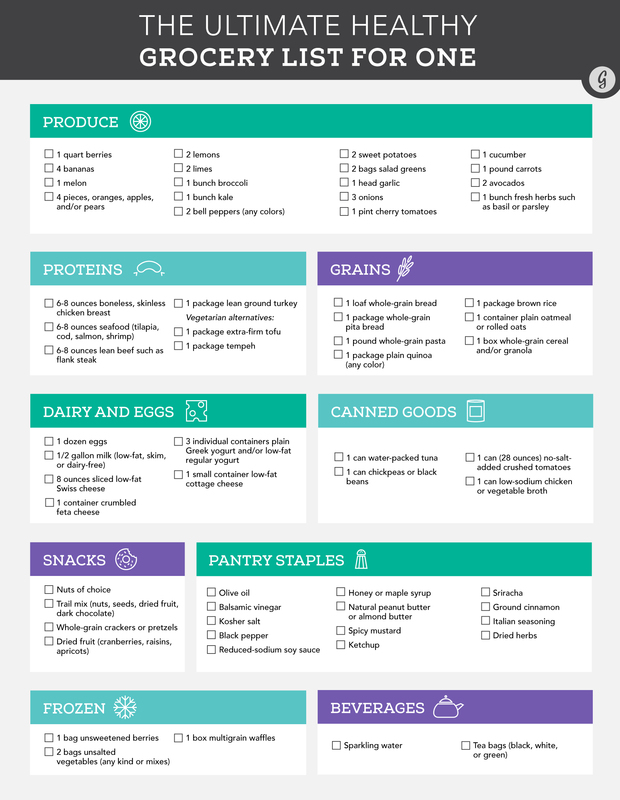 Check out this grocery list and stock up on all things wholesome and healthy. Now that you’ve got a fridge full of goodies you can follow these super easy and healthy meal plans. And trust us, you won’t be complaining about this diet; they’re delicious! Alright – you’ve gained quite a bit of how-to-get-killer-abs knowledge. Now, it’s time for action! There is an infinite amount of ab exercises out there. It seems like a “new and improved” move pops up every week. It’s difficult to know which work and which don’t. These days it’s pretty much unanimously agreed upon that sit ups will not help you get the flat belly you’re aiming for. Studies have even shown sit ups can cause more harm than good, as the exercise pulls at the lower spine, causing back pain. The alternatives are bodyweight exercises such as Pilates moves or yoga poses, favored by fitness experts. And the best thing about that is there’s no gym required! All these exercises can be done AT HOME, AT ANYTIME, using your own body weight and/or a small prop. Take a look at this expert-approved list below. Combine any three of these ab sculpting exercises with your cardio or HIIT routine today and be prepared to start seeing results in as little as 1-2 weeks! If you’re just starting out then it’s a good idea to stick to simple routines then gradually build up to more intense workouts. An old favorite of Pilates gurus, this move has gained more and more popularity in all fitness regimes due directly to its’ results. The plank is an excellent move because it targets the upper and lower abs, as well as the obliques. To start, lift your body into the elevated push up position, or top of a push up. Your elbows should be straight with your wrists directly under your shoulders. Hips should be slightly lifted, buttocks tucked and core activated and strong. Legs should be straight and hip width apart, toes to the ground, heels lifted and stretching to the back wall. Keep neck neutral and head parallel to the floor. Hold this pose for 30 seconds. Do three or four reps to start. Try to hold the pose for a few seconds longer every time. Once you get stronger, you will be able to perform the side plank, which is even better for fine tuning your obliques. Feel the burn: Once you’ve mastered both plank positions, try lifting one leg into the air and hold for as long as you can while in the side plank pose. Check out these videos of how to perform the perfect plank and side plank! As you get stronger consider trying variations in your plank. The video below will show you some good workouts to try. Lie flat on your back with your right leg bent towards your chest and the left leg straight. Engage the core and lift the head and neck off the floor. Twist from the torso and try to bring the left shoulder to meet the right knee. Hold for a few seconds, then slowly release the right leg and the torso down to the floor. Repeat the process for the left knee, twisting to the left with the right shoulder. That’s one rep.
Feel the burn: To increase the intensity on this move, try performing the same motion on a BOSU Ball (the prop with a flat plastic foundation on one side and an exercise ball on the other). The extra element here is balance. Remaining stable on an uneven or moving surface is more difficult, which further challenges and engages the abs. Check out this personal trainer demonstrating how to correctly perform this move in the video above. A simple exercise that can be used to tone the abs as well as warm up for more intense exercises. Start on your hands and knees, wrists below the shoulders and knees below the hips. Neck and head remain neutral. Raise and straighten the right leg until it’s level with your hips. Keep core strong and engaged; do not let the back “cave.” At the same time raise the left arm and bring it level with your ear. Hold here for a few seconds, then slowly lower. Repeat 5 to 10 reps per side, then switch. Feel the burn: for an extra punch, try to crunch at the “top” of the exercise. Once you have the alternate leg and arm extended, pull the elbow and knee in under the body simultaneously and try to meet under your belly button. Remember to pull the core in and tighten the abs while you perform the crunch. Bird Dog Plank (Alternating Arm and Leg Raise)– This move takes the Bird Dog and adds a plank, making the move more challenging. Come to your perfected plank position, as taught above. Then lift the right leg and the left arm off the ground at the same time, as you would with the original Bird Dog exercise. Keep you core tight and motionless and hold this pose for a few seconds. Lower and repeat on the opposite side. That’s one rep. Extra perk: this move also works your glutes! This is a great move for lower abs and hip flexors. There are also varying degrees of difficulty, so once you master the move you can add another element to increase the challenge. Sit or lie on the ground or bench with your hands placed behind you for support. Keeping your back straight and pulling in your core, lift both legs up to a V position. Lower your legs until your feet are a few inches from the floor, then lift again. Feel the burn: kick it up a notch and work this move on a BOSU ball. Or perform the same move, but alternate legs, raising one at a time. When you raise your leg, raise the opposite arm and twist the torso, trying to touch fingers to toes. For this move you will need a Swiss ball. Come up to a plank, balancing your toes somewhere in the center of the ball. This initial starting position will challenge your core to begin with, so if this is tough enough, stop and hold here. For a more advanced move, lift your hips straight up, allowing the toes to roll a bit forward, but keeping your back straight. This is the “pike” position. Lower back down in a controlled motion and return to plank. That’s one rep. Lie on your back, face up, legs straight and arms at your sides. Slowly lift your head and legs off the ground, simultaneously. Continue to lift upwards until you reach a sitting position, legs bent at 90 degrees and arms reaching straight towards your toes. Hold the pose her for a few seconds. Slowly lower down into the original starting position. That’s one rep.
Feel the burn: When you reach the top of the pose, slowly rotate your torso to the left, twisting until both arms are on the outside of your left knee. Try to twist as far as you can without losing your balance. Come back to the center and pause. Then rotate your torso to the right, placing both arms on the outside of the left knee. Come back to center, then slowly lower down. See this image for pointers on your form and different variations. To start, perform any three of these exercises at the end of your cardio/HIIT workout. Try to complete 3 sets of 10 reps for each exercise. As you get stronger, increase the number of reps.
Another option is to track how many reps you can perform of each exercise in 30 seconds. Try to improve your score each time. Don’t forget to vary the exercises and attempt the more challenging version once you’re feeling confident! You are now fully equipped with the knowledge and power to get the abs you’ve always wanted! Remember, there’s no quick fix. You must be determined and disciplined. But if you follow our guide to eating well and exercising right, you will see results. Was our guide helpful? Let us know and share on Facebook, Twitter or your preferred social media outlet! Below is a good summary of the formula to get abs. Now that you know more about the abdominal muscles as a whole, you can learn how to get abs by targeting each muscle individually. Doing this will get you that toned, taut tummy you’ve always wanted. So, how do we build muscle and get stronger abs? Simply put, muscle is created when the muscle fibers experience trauma or injury caused by intense exercise. This triggers the satellite cells, located on the outside of the muscle tissue, to begin taking measures to repair the damaged fiber. They do this by multiplying themselves then replacing the damaged fiber, which leads to an increase in muscle. This doesn’t mean you go out and cause serious harm to yourself – go easy! The first thing to note about the abs is that they are a very small muscle group. You do not need to train them everyday. You also need to allow your muscles the time to heal and repair themselves. Instead of going hard seven days a week, try alternating days. In addition, going too hard, too fast – especially if you’re not in shape – can result in muscle strains, pulls and injuries that will set you back.